Patented design has a minimal footprint, extends taller and collapses lower. 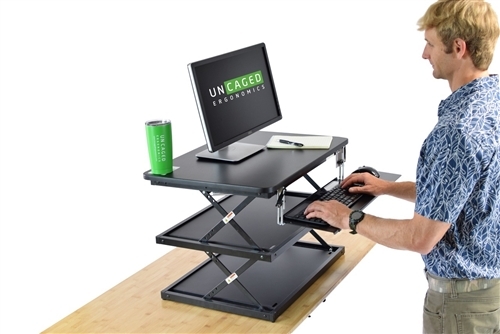 Includes height-adjustable keyboard tray. Min Height (to the top panel):4"
* Top Panel Size:20 x 28"
Max Height (to the top panel):21.25"
* Middle Panel Size:18" x 25.25"
* Bottom Panel Size:18" x 25.25"
* Keyboard Tray Dimensions:23.75 x 6.5"
* Mouse Pad Dimensions:7" x 6.6"
Footprint (Amount of desk space needed):18" x 25.25"
Enjoy the health, energy, and productivity benefits of standing throughout the workday with our patent-pending CHANGEdesk. Quick and easy height adjustment lets you switch positions in seconds, bringing your monitor and keyboard to the perfect ergonomic height. HUGE adjustable height range (from 4.5" collapsed all the way up to 21.5") comfortably fits people up to 6'5". No installation required. What Separates CHANGEdesk from the Competition? 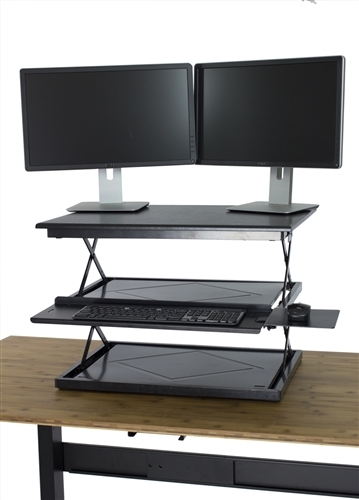 HUGE HEIGHT RANGE: from 4.5" to 21.5" = no more hunching + no extra monitor risers needed. 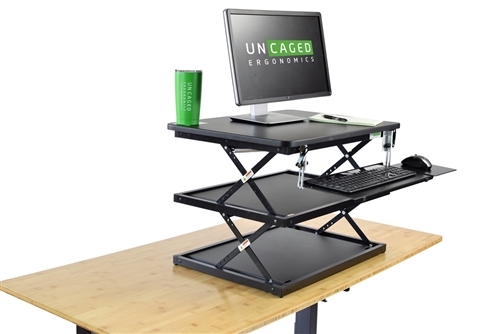 ADJUSTABLE KEYBOARD TRAY: Distance between your keyboard and monitor is adjustable, as it should be. No installation required; simply place on top of your existing work surface. Smooth, fast, hydraulic height adjustment. Just squeeze the lever and raise/lower CHANGEdesk. HUGE adjustable height range (4.5-21.5") - we go lower and extend taller for better ergonomics! 5 height settings accommodate users up to ~6'5"
Huge height range - raises your monitor to 5 positions from 4" to 21.5"
If you're looking for all the benefits of an adjustable height desk at a price that doesn't break the bank, CHANGEdesk is the perfect option. With smooth and easy height adjustment, hefty weight capacity, and adjustable keyboard tray, CHANGEdesk provides premium quality and design at an affordable price. 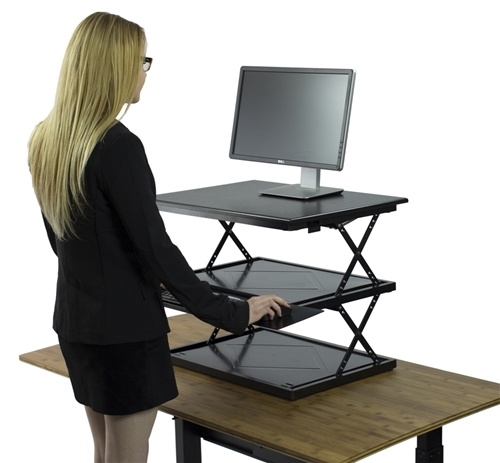 CHANGEdesk is the ideal standing desk conversion for anyone looking to improve their posture and create an "active" desk environment without breaking the bank.